Meyerozyma guilliermondii (anamorph Candida guilliermondii) and Meyerozyma caribbica (anamorph Candida fermentati) are closely related species of the genetically heterogenous M. guilliermondii complex. Conventional phenotypic methods frequently misidentify the species within this complex and also with other species of the Saccharomycotina CTG clade. Even the long-established sequencing of large subunit (LSU) rRNA gene remains ambiguous. We also faced similar problem during identification of yeast isolates of M. guilliermondii complex from indigenous bamboo shoot fermentation in North East India. There is a need for development of reliable and accurate identification methods for these closely related species because of their increasing importance as emerging infectious yeasts and associated biotechnological attributes. We targeted the highly variable internal transcribed spacer (ITS) region (ITS1-5.8S-ITS2) and identified seven restriction enzymes through in silico analysis for differentiating M. guilliermondii from M. caribbica. Fifty five isolates of M. guilliermondii complex which could not be delineated into species-specific taxonomic ranks by API 20 C AUX and LSU rRNA gene D1/D2 sequencing were subjected to ITS-restriction fragment length polymorphism (ITS-RFLP) analysis. Taq I ITS-RFLP distinctly differentiated the isolates into M. guilliermondii (47 isolates) and M. caribbica (08 isolates) with reproducible species-specific patterns similar to the in silico prediction. The reliability of this method was validated by ITS1-5.8S-ITS2 sequencing, mitochondrial DNA RFLP and electrophoretic karyotyping. We herein described a reliable ITS-RFLP method for distinct differentiation of frequently misidentified M. guilliermondii from M. caribbica. Even though in silico analysis differentiated other closely related species of M. guilliermondii complex from the above two species, it is yet to be confirmed by in vitro analysis using reference strains. This method can be used as a reliable tool for rapid and accurate identification of closely related species of M. guilliermondii complex and for differentiating emerging infectious yeasts of the Saccharomycotina CTG clade. Meyerozyma guilliermondii is a genetically heterogenous complex belonging to the Saccharomycotina CTG clade . This complex consists of phenotypically indistinguishable and closely related species namely Meyerozyma guilliermondii (anamorph Candida guilliermondii), Meyerozyma caribbica (anamorph Candida fermentati), Candida carpophila, Candida smithsonii, Candida athensensis, Candida elateridarum and Candida glucosophila[2–6]. Apart from its presence in healthy human [7, 8], M. guilliermondii also exists in clinical [3, 9] and environmental samples . This organism is widely studied in various aspects due to its clinical importance, biotechnological applications and biological control potential . C. guilliermondii is regarded as an emerging infectious yeast of the non-albicans Candida (NAC) species group which accounts for 1 – 5% of nosocomial blood stream infections worldwide [9, 12, 13]. However, in certain geographical regions such as Brazil, India and Italy, over 10% of all the candidaemia cases are caused by this species . The threat posed by this organism is ever increasing due to the decreased susceptibility and emergence of strains resistant to antifungal drugs like polyene (amphotericin B) and azoles (fluconazole and itraconazole), leading to mortality in candidaemia patients [9, 12, 15]. C. fermentati has been rarely found to be associated with candidaemia [16, 17]. But due to the poor discernability of C. fermentati from C. guilliermondii, they are commonly misidentified in clinical laboratories. Apart from being organisms of clinical importance, M. guilliermondii and M. caribbica are often linked with fermented foods [18–20]. M. guilliermondii is known for the production of flavour compounds in fermented food products . Further, in a study with soybean paste fermentation, M. guilliermondii and M. caribbica have been claimed for the efficient production of isoflavone aglycone which is a widely known bioactive compound for its various health promoting functions . M. guilliermondii is a flavinogenic yeast which is known for the overproduction of vitamin B2 (riboflavin) . Moreover, isolates of M. guilliermondii and M. caribbica have exhibited great potential in the biological control of fungi responsible for postharvest spoilage of fruits and vegetables [24–26]. These yeast species with enhanced biological control efficacy have emerged as a potential alternative to the conventional fungicide treatment. Considering the various importance and applications of the two species, there is a need for the development of accurate and reliable method to identify and distinctly discriminate the closely related species. Current methods of yeast identification, mostly in clinical practice, are mainly based on the conventional and rapidly evolving commercial phenotypic and biochemical methods. However, such methods are often unreliable for accurate identification of closely related yeast species [13, 27]. According to recent studies, M. guilliermondii and M. caribbica are extremely difficult to differentiate by the phenotypic methods [28–31]. We also faced similar problem during differentiation of yeast isolates from soibum, an indigenous fermented bamboo shoot product of North East India (Additional file 1: Table S1). The widely used API 20 C AUX yeast identification system and sequencing of large subunit (LSU) rRNA gene D1/D2 domain failed to give proper species-level taxonomic assignment to these isolates (Additional file 1: Tables S2 and S3). Moreover, the phylogenetic tree reconstructed from the publicly available D1/D2 sequences of different strains of M. guilliermondii and M. caribbica failed to discriminate the two species (Additional file 2: Figure S1). Several attempts have been made using molecular approaches such as DNA base composition, electrophoretic karyotyping [6, 32], multi locus sequence typing (MLST) , multi locus enzyme electrophoresis (MLEE), randomly amplified polymorphic DNA (RAPD) , sequencing of internal transcribed spacer (ITS) [28, 30], intergenic spacer restriction fragment length polymorphism (IGS-RFLP)  and RFLP of housekeeping genes such as riboflavin synthetase gene RIBO in order to resolve the misidentification. Some recent studies have claimed that the matrix-assisted laser desorption ionization-time of flight mass spectrometry (MALDI-TOF-MS) is advantageous over previous approaches for reliable identification of clinically important NAC and non-Candida yeast species [28, 31, 33, 34]. Unfortunately, MALDI-TOF-MS requires reference spectra of accurately identified closely related strains otherwise the results may be erroneous. On the other hand, the sequence-based studies have considered the ITS1-5.8S-ITS2 region as universal DNA barcode for yeast identification  and the RFLP of ITS1-5.8S-ITS2 region has successfully separated the closely related species in the genera Candida and Pichia[36, 37]. Therefore, in this study, we targeted the ITS1-5.8S-ITS2 region to develop a simple RFLP method for accurate taxonomic assignment of M. guilliermondii and M. caribbica. With this background, the aim of the present study was (i) to perform in silico prediction of restriction enzymes to discriminate M. guilliermondii and M. caribbica using the publicly available ITS1-5.8S-ITS2 sequences, (ii) to evaluate the selected enzymes by in vitro ITS-RFLP analysis of ambiguously identified 55 yeast isolates for species-specific taxonomic assignment, and (iii) to validate the taxonomic assignment by ITS1-5.8S-ITS2 sequencing, mitochondrial DNA (mtDNA)-RFLP and pulsed field gel electrophoresis (PFGE) karyotyping. The yeast isolates used in the present study are listed in Additional file 1: Table S1. These isolates were obtained from samples collected at different stages of indigenous bamboo shoot fermentation for the production of soibum in Manipur state of North East India . The sample (10 g) was homogenized in 90 mL of sterile physiological saline (1 g/L bacteriological peptone, 8.5 g/L NaCl, pH 6.1) using Stomacher® 400 Circulator (Seward, Worthing, West Sussex) at 250 rpm for 3 min. The yeasts were isolated by serial dilution spread-plating of the above homogenate on yeast extract peptone dextrose (YEPD) agar medium (pH 6.5) (HiMedia, Mumbai, India) containing 100 μg/mL each of filter-sterilized ampicillin and tetracycline (Sigma-Aldrich, Bangalore, India), followed by incubation at 30°C for 48 − 72 h under aerobic conditions. All the isolates were purified by sub-culturing twice on the same agar medium and preserved at −80°C in YEPD broth containing 10% (v/v) sterile glycerol (Sigma-Aldrich). For short term storage, the cultures were maintained at 4°C on YEPD agar. The type strain C. guilliermondii ATCC 6260 used for comparison was obtained from American Type Culture Collection. Phenotypic identification of the yeast isolates was carried out using the API 20 C AUX yeast identification system (bioMérieux, New Delhi, India) following manufacturer’s instructions. Colony and cell morphology of the isolates were studied using SZ-PT stereo binocular microscope (Olympus, Japan) and BX61 phase contrast microscope (Olympus). The full length ITS1-5.8S-ITS2 sequences of M. guilliermondii and M. caribbica were retrieved from NCBI (http://www.ncbi.nlm.nih.gov/) and Centraalbureau voor Schimmelcultures (CBS-KNAW) yeast nucleotide databases (http://www.cbs.knaw.nl/Collections/Biolomics.aspxTable=CBSstraindatabase). Type strain sequences of the two species, C. guilliermondii ATCC 6260 [GenBank: AY939792.1] and M. caribbica CBS 9966 (http://www.cbs.knaw.nl/Collections/BioloMICS.aspx?Link=T&TargetKey=14682616000000137&Rec=36291&Revert=F) were subjected to in silico PCR amplification using primers ITS1 (5′-TCCGTAGGTGAACCTGCGG-3′) and ITS4 (5′-TCCTCCGCTTATTGATATGC-3′)  to trim off the untargeted regions on both 5′ and 3′ ends of the sequences using the online Sequence Manipulation Suite (http://www.bioinformatics.org/sms2/pcr_products). Using NEBcutter, version 2.0 (http://tools.neb.com/NEBcutter2/), the ITS amplicon sequences were subjected to in silico restriction digestion using the commercially available type-II restriction endonucleases listed in the REBASE database (http://rebase.neb.com/)  to select the enzymes which cut the two sequences differently at not more than 5 cleavage sites. Multiple sequence alignment of 10 additional ITS1-5.8S-ITS2 sequences of different strains from different ecological niches for each species was performed using Clustal X, version 2.0 (http://www.clustal.org/clustal2/) and BioEdit, version 7.2.0 (http://www.mbio.ncsu.edu/bioedit/bioedit.html) to confirm the taxa-specificity of the selected restriction enzymes. DNA was extracted from pure cultures as cell-free DNA lysate using lyticase-heat lysis method. Briefly, a single colony of 24 − 48 h old culture from YEPD agar was inoculated to 5 mL of YEPD broth supplemented with antibiotics, and incubated for 18 h at 30°C with shaking at 200 rpm. Cells were harvested from 1 mL of the culture broth at 5,000 g for 5 min (FA-45-24-11, Centrifuge 5424, Eppendorf, Hamburg, Germany). The cell pellet was washed twice with 1 mL sterile 0.5 M NaCl followed by sterile deionized water (Milli Q, Millipore, Molsheim, France). The cells were finally resuspended in 500 μL of 1× TE buffer (10 mM Tris-Cl, 1 mM EDTA, pH 8.0) containing 10 μL of lyticase (5U/μL) (Sigma-Aldrich) and incubated at 37°C for 1 h. After the incubation, the spheroplasts were lysed by heating at 95°C for 20 min. The crude cell-free lysate was collected by centrifugation at 10,000 g for 10 min at 4°C and the DNA was quantified spectrophotometrically (Nanodrop ND-1000, NanoDrop Technologies, Inc., Rockland, USA). The cell-free lysate with absorbance ratio (A260/280) of 1.8 − 2.2 was used for PCR analysis and stored at −20°C until required. ITS1-5.8S-ITS2 was amplified from the cell-free DNA lysate using primers ITS1 and ITS4 mentioned elsewhere. The amplification was carried out in a 25 μL final reaction volume containing 50 ng of the genomic DNA as previously described . The amplified ITS fragment was analyzed by 2.0% (w/v) agarose gel electrophoresis at 80 V in 0.5× TBE (45 mM Tris-borate, 1 mM EDTA, pH 8.0) buffer to check its intactness and absence of non-specific amplification. The PCR product (4 μL) was digested with 5 U of Taq I (Promega, Madison, USA) in a 10 μL reaction volume at 65°C as per manufacturer’s instructions. The restriction patterns were analyzed by electrophoresis of the 10 μL reaction volume on 2.0% (w/v) agarose gel in parallel with PCR 100 bp Low DNA ladder (Sigma-Aldrich) as molecular size standard. The electrophoresis was run at 80 V for 2 h in 0.5× TBE buffer. The gel was then stained in 0.5 μg/mL ethidium bromide solution for 30 min with rocking at 15 rpm on a platform rocker (Tarsons, Kolkata, India). After destaining for 30 min in sterile deionized water, the gel was photographed using ChemiDoc MP gel documentation system (Bio Rad, Hercules, USA). The restriction fingerprints were analysed for the absence or presence of discriminating fragments using GelCompar II software, version 6.5 (Applied Maths, Sint-Martens-Latem, Belgium). A single colony of 24 − 48 h old culture from YEPD agar was inoculated to 5 mL of YEPD broth supplemented with antibiotics, and incubated for 18 h at 30°C with shaking at 200 rpm. The grown culture was inoculated into 50 mL of fresh YEPD broth (initial OD600 =0.1) and incubated in the above conditions till mid-logarithmic growth phase (final OD600=0.4 − 0.8). Cells of 20 OD600 were harvested at 1,800 g for 5 min at 4°C (A-4-81, Centrifuge 5810R, Eppendorf). The mtDNA was extracted as previously described  with some modifications. The cells were resuspended and washed with 5 mL of yeast resuspension buffer (50 mM Tris-Cl, 20 mM EDTA, pH 8.0) and stored at −20°C for 10 min. Lyticase (50 U) (Sigma-Aldrich) was used to produce spheroplast and 15 μL of 1 mg/mL RNase A solution (Sigma-Aldrich) was added during cell lysis. The total DNA was precipitated at −20°C for 1 h. After quantifying the DNA content spectrophotometrically, the DNA was freeze dried, re-dissolved in sterile deionized water to a final concentration of 1 μg/μL and stored at −20°C till further use. Restriction digestion was carried out on 10 μg of the DNA in a 20 μL reaction volume using 10 U each of Hae III and Hinf I (Promega) according to manufacturer’s instructions. The restriction patterns were generated by 1.0% (w/v) agarose gel electrophoresis of the 20 μL reaction volume at 80 V in 0.5× TBE buffer for 4 h in parallel with 1 kb DNA ladder (Promega). After staining and documentation, the restriction fingerprints were subjected to cluster analysis using unweighted pair group method with arithmetic mean (UPGMA) algorithm on Jaccard similarity coefficients using GelCompar II. Composite data set of the restriction digestion profiles was generated with 1.0% position tolerance to generate the clustering. Bootstrap analysis with 1,000 replicates was performed to indicate the branch quality. Intact chromosomal DNA for electrophoretic karyotyping using PFGE was prepared as previously described . The electrophoresis was carried out in 1.0% (w/v) PFGE-grade agarose gel (Sigma-Aldrich) and 0.5× TBE buffer at 13 − 14°C and 150 V in contour-clamped homogeneous electric field electrophoresis apparatus (Gene Navigator, Amersham Biosciences, Uppsala, Sweden). The gel was run for 22 h with a switch interval of 90 s for 8 h followed by 105 s for 6 h and finally 120 s for 8 h in parallel with PFGE marker (225 − 22,000 kb) from Saccharomyces cerevisiae strain YPH80 (Sigma-Aldrich). Staining and documentation were performed as mentioned elsewhere. The representative isolates from each ITS-RFLP genotype group were randomly selected for sequencing ITS1-5.8S-ITS2 and LSU rRNA gene D1/D2 domain. ITS1-5.8S-ITS2 was PCR amplified as mentioned elsewhere. Amplification of D1/D2 region was carried out using primers NL1 (5′-GCATATCAATAAGCGGAGGAAAAG-3′) and NL4 (5′-GGTCCGTGTTTCAAGACGG-3′) as previously described . The amplified products were purified using NucleoSpin® Extract II gel extraction kit (Machery-Nagel, Düren, Germany) following manufacturer’s instructions. The PCR products were sequenced using ABI 3100 Genetic Analyser (Merck, Bangalore, India) with the same primers used for the amplification. The sequence reads were validated by analysing the electropherogram data using ChromasLITE software, version 2.01 (http://technelysium.com.au/). To identify the closest known relatives, the sequences were queried with NCBI and CBS yeast nucleotide databases. The sequences obtained from both sequencing and nucleotide databases were aligned using Clustal X algorithm and a neighbour joining tree was constructed by Kimura’s evolutionary distance matrix obtained from the multiple sequence alignment using MEGA4 phylogenetic software. Bootstrap values for 1000 replicates were shown at the node of cluster branch. The sequences were deposited to NCBI GenBank under the following accession numbers: JF439366 − JF439369 and KF268351 − KF268354. The full length ITS1-5.8S-ITS2 sequences of M. guilliermondii and M. caribbica were retrieved from NCBI and CBS yeast nucleotide databases and subjected to multiple sequence alignment followed by in silico restriction digestion. Three variable regions differentiating M. guilliermondii from M. caribbica were identified. Seven restriction enzymes (Ars I, Bfa I, Bsr I, Hpy 188I, Hpy CH4III, Mme I and Taq I) which cut the variable regions differently were identified (Figure 1A and Additional file 2: Figure S2). Considering the length and the number of polymorphic fragments with sizes greater than 100 bp (for easy analysis in normal agarose gel), Bfa I, Mme I and Taq I were found appropriate. Notably, commonly available Taq I gave distinct species-specific differentiation between the two species (Additional file 1: Table S4 and Additional file 2: Figure S3). We also tested the selected three restriction enzymes (Bfa I, Mme I and Taq I) for differentiating M. guilliermondii and M. caribbica from other closely related members of M. guilliermondii complex (Additional file 1: Table S4). Except C. carpophila and M. caribbica, all other members of M. guilliermondii complex were distinctly differentiated during the analysis. 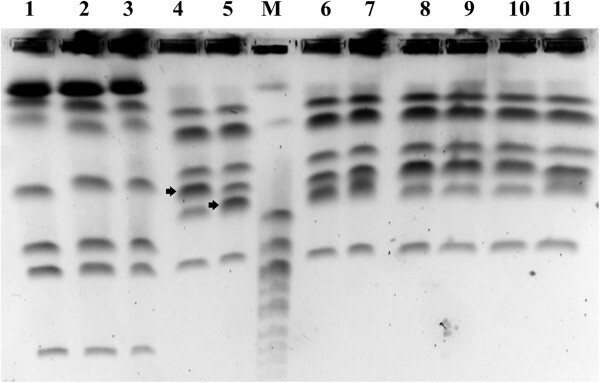 Differentiation of M. guilliermondii and M. caribbica by Taq I digestion of ITS1-5.8S-ITS2. A: Multiple sequence alignment of representative ITS1-5.8S-ITS2 sequences of the two species obtained from NCBI GenBank and CBS yeast database showing position of Taq I recognition site (highlighted) which distinctly differentiated the two species. B: Taq I restriction digestion profile of ITS1-5.8S-ITS2 amplicons obtained from some of the representative isolates. Lane 1: C. guilliermondii ATCC 6260; Lane 2 − 12: isolates of M. guilliermondii genotype group MG (A1S10Y1, A2S10Y1, A3S9Y1, A2S9Y1, A3S11Y1, A3S2Y1, A3S6Y1, A2S6Y1, A1S9Y1, Kw3S3Y1 and Kw2S11Y2); Lane 13 – 20: isolates of M. caribbica genotype group MC (A1S10Y2a, A1S10Y3, A1S10Y5, Kw3S2Y1, Kw2S3Y1, Kw3S3Y3, Kw3S3Y4 and Kw1S7Y2); Lane M: PCR 100 bp Low DNA ladder (Sigma-Aldrich). To validate the above in silico selection, the 55 yeast isolates of M. guilliermondii complex (which were not differentiated by phenotypic characterization and D1/D2 sequencing) were analysed by ITS-RFLP using the selected Taq I restriction enzyme in comparison with the type strain C. guilliermondii ATCC 6260. All the tested isolates and the type strain gave a single PCR amplicon of molecular size of 607 bp. As predicted by the in silico analysis, Taq I ITS-RFLP distinctly differentiated the isolates into two genotype groups. Forty seven isolates produced M. guilliermondii-specific pattern (MG), while the remaining eight isolates generated M. caribbica-specific pattern (MC) (Table 1). Examples of Taq I ITS-RFLP profiles differentiating the above two species are shown in Figure 1B. *No identification data for M. caribbica is included in the database. The above ITS-RFLP based discrimination of M. guilliermondii and M. caribbica was further confirmed by ITS1-5.8S-ITS2 sequencing, mtDNA-RFLP fingerprinting and PFGE karyotyping (Table 1). The ITS sequences of the isolates in each genotype group MG and MC matched with the sequences of the type strains C. guilliermondii ATCC 6260 and M. caribbica CBS 9966 with 99.6% and 99.8% similarity respectively. The sequences between the two groups were 99% identical showing only 5 nucleotide differences which were the same as shown by the above type strain sequences. 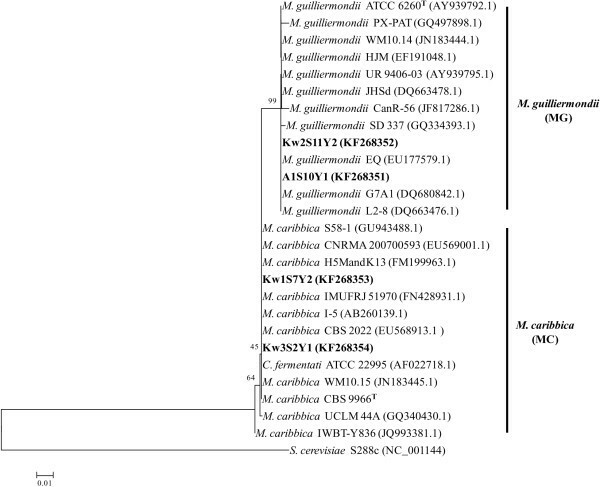 Unlike D1/D2 region, the ITS sequences formed distinct cluster of M. guilliermondii and M. caribbica during phylogenetic analysis (Figure 2). The ITS sequences of M. guilliermondii strains PX-PAT, CanR-56 and SD 337; M. caribbica strains UCLM 44A and IWBT-Y836 showed 1 – 3 nucleotide differences which was reflected as divergence within the clusters. The mean evolutionary divergence of 0.0131 between the two clusters was 6 times more than the divergence within each cluster. Neighbour-joining (NJ) phylogenetic tree showing taxa-specific separation of M. guilliermondii from M. caribbica. The tree was constructed based on the evolutionary distance calculated using Kimura-2 parameter from the nucleotide sequence of ITS1-5.8S-ITS2. The percentage of replicate trees in which the associated taxa clustered together in the bootstrap test (1000 replicates) is shown next to the branches for values >40%. The bar represents 1% sequence divergence. GenBank accession numbers are mentioned within the parentheses. S. cerevisiae was the outgroup in the analysis. T =Type strain. The mtDNA-RFLP using Hae III and Hinf I distinctly segregated the yeast isolates into M. guilliermondii and M. caribbica. mtDNA-RFLP profile-based dendrogram formed two clusters (Figure 3) similar to the ITS-RFLP groups. Between the two enzymes used, Hinf I showed higher polymorphism than Hae III. Electrophoretic karyotyping also distinctly discriminated the above two species (Figure 4). The species-specific mtDNA-RFLP pattern suggested that the isolates of each group belonged to only one strain (Figure 3). 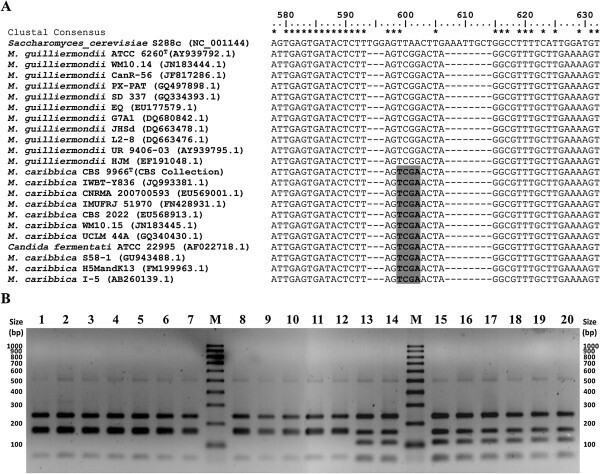 Whereas electrophoretic karyotyping brought out strain level diversity in both the groups which confirmed that multiple strains of M. guilliermondii and M. caribbica were involved in the indigenous bamboo shoot fermentation (Figure 4 and Additional file 2: Figure S4). mtDNA-RFLP based dendrogram showing distinct clustering of M. guilliermondii and M. caribbica . The dendrogram was constructed using UPGMA algorithm on Jaccard similarity coefficients generated from Hae III and Hinf I restriction digestion profile of mtDNA of some of the representative isolates. Value at each branch node indicates the branch quality with 1000 bootstrap replications. The scale represents the similarity. PFGE karyotype patterns of isolates belonging to M. guilliermondii and M. caribbica genotype groups. Lane 1: C. guilliermondii ATCC 6260; Lane 2 − 3: M. guilliermondii isolates A1S10Y1 and Kw2S11Y2; Lane 4 − 11: M. caribbica isolates A1S10Y2a, A1S10Y3, A1S10Y5, Kw3S2Y1, Kw2S3Y1, Kw3S3Y3, Kw3S3Y4 and Kw1S7Y2; Lane M: S. cerevisiae PFGE marker (Sigma-Aldrich). Right arrow indicates the co-migrating chromosomal doublets showing strain level diversity. In recent times, the frequency of emerging infectious diseases caused by the opportunistic yeast species of NAC and non-Candida groups has increased in immunosuppressed patients [12, 44]. This is linked with the indiscriminate use of broad-spectrum antifungal drugs and global climate change [45–47]. Most of these closely related yeast species are often misidentified by the conventional phenotypic, biochemical and antibiotic susceptibility methods. Thus, accurate identification of these species has become essential for clinical management and effective antifungal therapy. In the present study, we showed that the developed ITS-RFLP method was reliable and consistent for distinct differentiation of closely related M. guilliermondii from M. caribbica for which phenotypic methods and D1/D2 sequencing were inconclusive. Our results also indicated that sequencing of both D1/D2 and ITS regions will increase the resolution of species identification which can be further improved by multigene sequence-based phylogenetic approach [3, 48, 49]. However, the presence of incorrectly identified, insufficiently annotated and non-updated entries in the public nucleotide databases may underestimate the resolving power of these taxonomic markers . Out of the 29 sequences of LSU rRNA gene for M. guilliermondii available in NCBI GenBank, 17 sequences (58.62%) clustered with M. caribbica type strain CBS 9966 [GenBank: EU348786] (Additional file 2: Figure S1). The choice of appropriate restriction endonucleases is critical for RFLP experiments. The commonly used Cfo I, Hae III and Hinf I [37, 41] failed to segregate M. guilliermondii from other species of the same genus during in silico and in vitro ITS-RFLP analysis. Our results indicated that in silico selection of restriction enzymes using the publicly available sequences from various strains of the target species is a better approach than randomly selecting the previously described and commonly used enzymes. This approach has been proven to be highly effective and reproducible [36, 51–53], and many online resources have been developed for this purpose [54–57]. Clinical isolates of Candida famata and Candida palmioleophila were also frequently misidentified as M. guilliermondii[30, 31]. In silico analysis confirmed that the developed ITS-RFLP method can also discriminate these species (data not shown). This in silico selection approach can be effectively applied to other cryptic yeast species of clinical importance for the development of RFLP based diagnostic tools. The developed method of ITS-RFLP using Taq I differentiated M. guilliermondii and M. caribbica at species level. This method is simple, rapid and reliable in comparison to the commonly used sequencing methods. The entire analysis starting from DNA extraction to ITS-RFLP profiling can be completed within 8 h. Further studies using higher number of strains of these two species from different clinical sources are required to confirm the robustness of this method for diagnostic applications. Though the combination of ITS-RFLP profiles generated by Taq I, Bfa I and Mme I differentiated other closely related species of the M. guilliermondii complex from M. guilliermondii and M. caribbica during in silico analysis, it is yet to be confirmed through in vitro analysis using reference strains. In our present study the use of either Hae III or Hinf I for mtDNA-RFLP was sufficient to differentiate the two species, but failed to give strain level differentiation even when both enzymes were used. This demonstrated that mtDNA-RFLP can also be used for distinct differentiation of closely related species. The Hinf I mtDNA-RFLP pattern of our M. guilliermondii isolates was similar with the mtDNA restriction pattern ‘E’ of M. guilliermondii strains isolated from wineries in Alentejo, Portugal . This genotype was linked with the production of flavour compound, 4-ethylphenol in wine. The major phenolic flavour compound (4-methylphenol) detected from fermented bamboo shoot product, soibum (Singh NR: unpublished observations) might also have originated from M. guilliermondii. Future study is required to characterize the flavour compound producing strain for starter culture development. Though fresh bamboo shoots are highly perishable, the fermented bamboo shoot can be preserved up to one year after fermentation without any deterioration or change in its organoleptic character. This long term preservation may be linked with the dominant presence of M. guilliermondii which has been reported as an efficient biological control agent [24, 25]. Being an emerging infectious yeast, the presence of M. guilliermondii in fermented food is a great concern regarding the safety of its consumption. Further study in strain level is required to unravel the pathogenic potential of M. guilliermondii associated with soibum fermentation. In this study, we described an ITS-RFLP method developed through an integrated approach of in silico selection of restriction enzymes and in vitro validations for distinct differentiation of frequently misidentified M. guilliermondii from M. caribbica, which can be used as an alternative or an adjunct to ITS sequencing. This method may be used for rapid and accurate identification of emerging infectious yeasts of the Saccharomycotina CTG clade. This approach can also be used for other closely related species complex when phenotypic methods and D1/D2 sequencing are ambiguous. The research was supported by the Department of Biotechnology (DBT), Govt. of India funded project (BT/PR-9268/FNS/20/342/2007). Wahengbam Romi is a recipient of Senior Research Fellowship from Council of Scientific and Industrial Research (CSIR), Govt. of India (112417/2 K10/1). We are grateful to Prof. N. Rajmuhon Singh for providing the data of flavour compounds associated with soibum. The authors would like to thank the indigenous producers of soibum in Andro and Kwatha villages, Manipur, India for their support during sample collection. WR and KJ conceived and designed the study, carried out the analysis and interpretation of the data and drafted the manuscript. WR carried out the molecular studies, performed the phenotypic identification and executed the in silico and sequence analyses. SK contributed to the molecular studies. GA and KJ critically revised the draft manuscript. All authors read and approved the final manuscript.